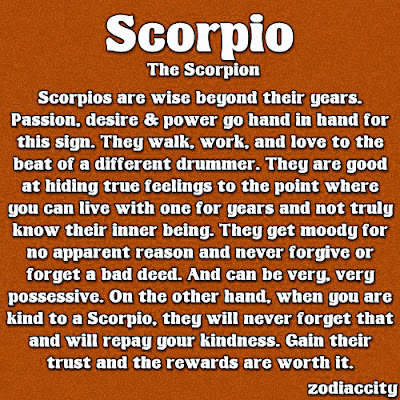 Scorpios are wise beyond their years. Passion, desire and power go hand in hand for this sign. They walk, work and love to the beat of a different drummer. They are good at hiding true feelings to the point where you can live with one for years and not truly know their inner being. They get moody for no apparent reason and never forgive or forget a bad deed. And can be very, very possessive. On the other hand, when you are kind to a Scorpio, they will never forget that and will repay your kindness. Gain their trust and the rewards are worth it.